For nearly 100 years, Worcester was the center of the commercial valentine industry in the United States. In 1847, according to local folklore, Worcester resident Esther Howland received an English valentine, which inspired her to design her own. She sold her cards through her father’s stationery store. Business flourished, and Esther recruited friends to assemble cards in a third-floor room at the family residence, 16 Summer Street. 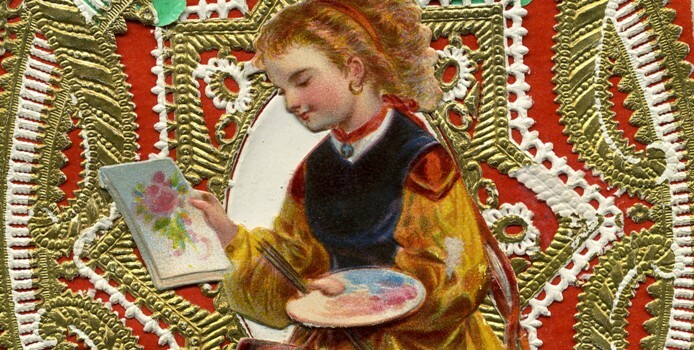 While it is generally agreed that Esther Howland was the first to make valentines in Worcester, according to Taft family folklore, Jotham Taft might have already been at work assembling Valentines in Grafton. Jotham and his wife built a successful valentine industry from their home in the early 1840s. Jotham’s son Edward formed a partnership with Esther Howland in 1879, called the New England Valentine Company. Valentine Company until 1869, when Edward withdrew from the partnership. In 1881, George C. Whitney bought the New England Valentine Company and incorporated into his operation. He also bought Jotham Taft’s business. The Whitney business proved to be highly successful. After George died in 1915, his son Warren took over management. The George C. Whitney Company continued to prosper until 1942, when the wartime paper shortage caused the liquidation of the largest greeting card company in the world. When Marion McPartland turned sixteen she quit school and went to work, like many young girls of her time. It was 1932. She was hired by the Whitney Valentine Company where her sister already had a job. She worked there assembling valentines on the fourth floor until 1937, a year after she married.